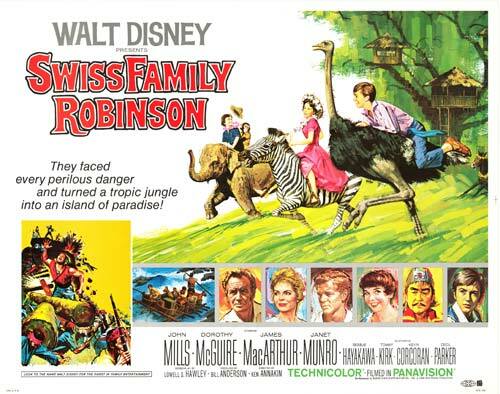 It seems only fitting that The Swiss Family Robinson should come with to the island. Not only is it effing awesome, but it could act as our survival guide. This movie teaches us all sorts of super useful survival techniques, such as how to (1) build a wicked cool tree house, (2) disguise yourself, albeit unsuccessfully, as a boy, (3) with limited resources, still look as good as Dorothy McGuire, and (4) fend off racially stereotyped pirates with coconuts and tigers. But if The Swiss Family Robinson has taught us anything it’s this: it’s much better to be stranded on a tropical island as opposed to a desert island because there is always plenty of fruit (for food) and animals (also for food, but for the occasional zebra vs. ostrich race, too). Yet as much as I love this movie, I find I always have to suspend my disbelief. How is it that they managed to salvage so much stuff from the shipwreck? There was a damn organ in that tree house! (Sidebar: This is also my problem with Gilligan’s Island. Why does Ginger have so many smurfing gowns? It’s absurd! Not to mention The Skipper and Gilligan’s endless supply of blue and red shirts. And don’t even get me started on Mrs. Howell. But I digress.) Despite the completely improbable plot (it is from Disney, after all) I adore this movie. I’ve watched it countless times and I never get tired of it. And, as T pointed out, it’s very meta to have an island movie on an island and I love anything meta. A final note… Many moons ago, whilst watching The Swiss Family Robinson for the 107th time, T and I wondered, as we were confused by the various accents of the actors, where does the Swiss Family Robinson hail from? To which T’s mom replied, with a look of pity and/or disgust, “Switzerland! They’re the Swiss Family Robinson!” Touché, Mrs. T’s Mom. Touché.